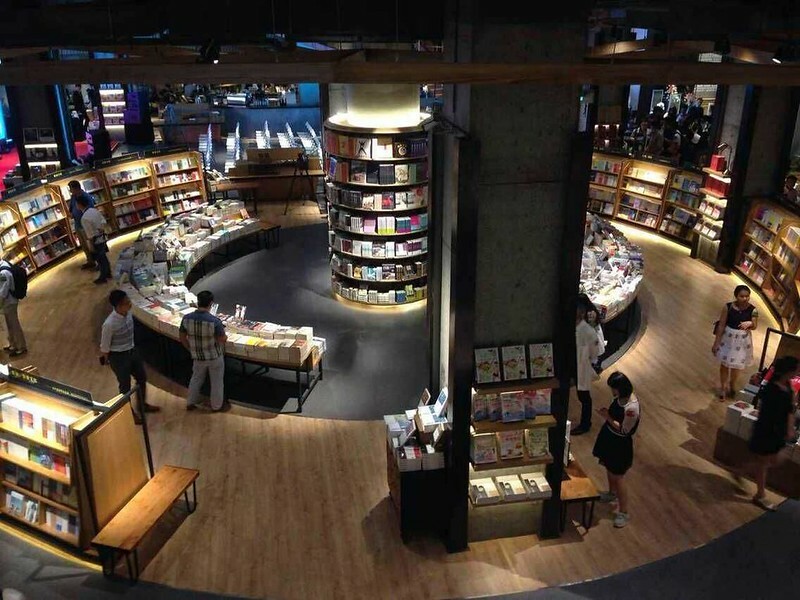 In Shanghai’s Changning Raffles City (长宁来福士) mall, there’s a new bookstore called Yan Ji You (言几又). Does that name strike you as weird? It should. It’s a weird name. 言 is used as a word by itself mostly just in classical Chinese, but then the use of 几 (grammar points here) and 又 (grammar points here) also don’t make sense. What’s going on? It’s not obvious, but the name as a deconstruction of the character 设, as in 设计, the word for “design.” When you break down the character 设, you can break it into “left-right” structure (⿰) first, giving you 讠 and 殳. Then 殳 can be further broken down as a top-bottom structure (⿱), giving you 讠, 几, 又. But 讠 (the “speech radical”) is just a simplified stand-in for 言, and 言 looks way better as a stand-alone character anyway, so the end result is 言几又. This kind of naming method is not entirely obvious, even to native speakers, and it’s not super common, either, from what I can tell. 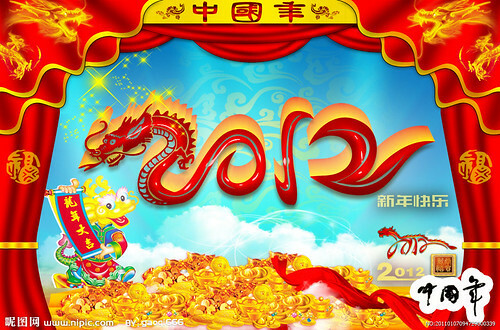 You can read more about 言几又 in Chinese on their Baidu Baike page. The first thing I noticed was its Escher-like quality, updated to a modern aesthetic. (Reminded me of Monument Valley even more than Escher directly, actually.) 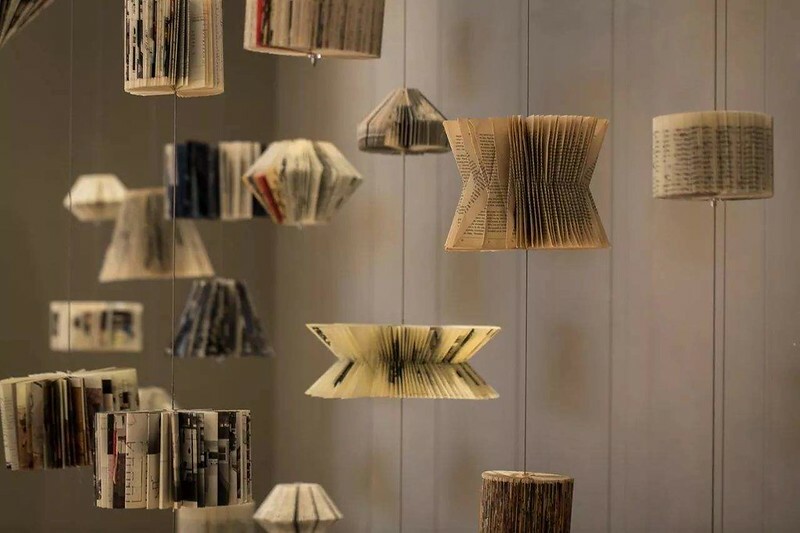 Very cool, and not something I see much in China, for sure! The second thing I noticed was that the stylized character on the poster is missing a few strokes. If this character is 家, then the bottom part is supposed to be 豕, which has 7 strokes. Instead, the bottom part looks more like the 5-stroke 永, minus the top stroke. What do your Chinese friends think? 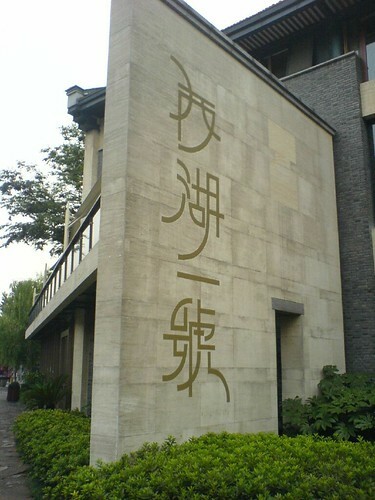 Cool design, or heinous affront to the sanctity of the 10 strokes of the Chinese character 家? Apparently 浅深 (literally, “shallow deep”) is a bathhouse in Shanghai. I’ve only ever seen it from the outside; I just like the design of the sign. Light posting these days as I’m down with a bad cold and Christmas sneaks up on me! > It’s not something you can commit to words, really, it’s something you have to feel. 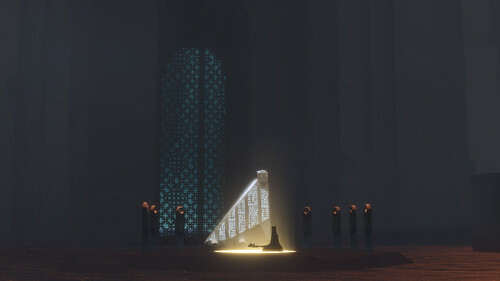 Should you choose to play the game – and I really hope you do – your trek through the ruins will be a very personal experience, the impact of which only you will truly understand. 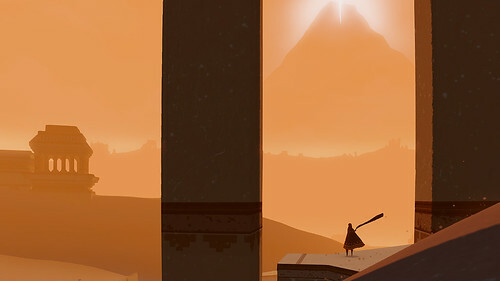 It won’t change your life, but it just might change your thoughts about what videogames can accomplish. The review above is fairly typical. The word “magical” tends to come up a lot in other reviews. Clearly, the game is extremely well designed, and people are duly impressed. 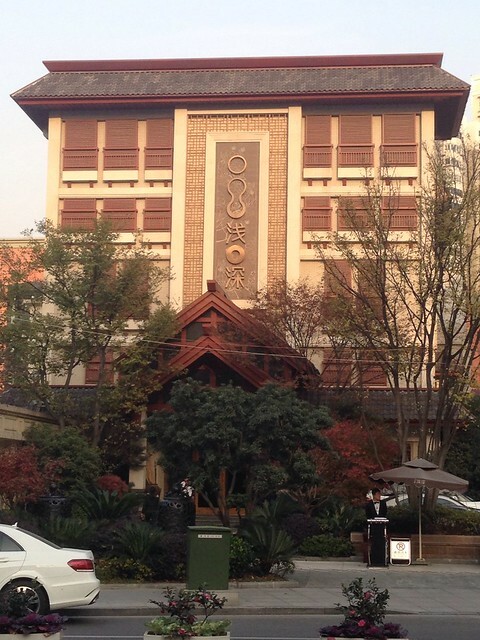 But at the heart of the design is a fascinating mashup of Chinese, Islamic, and even Tibetan design elements. I was a bit disappointed that I’ve so far been unable to find any in-depth coverage of the design inspiration for this game. My original impression was something like: aliens + mosques + 8-bit + Chinese characters + Lhasa. It’s probably the alien glyphs that impressed me the most. They have an 8-bit style, and the (sort of Moroccan?) 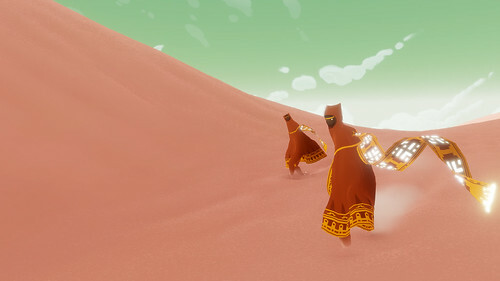 desert setting guides your mind to the idea of Arabic calligraphy, but the style of the characters themselves tends more toward over-grown Hebrew letters. Each glyph has a clear four-part internal structure to it, though, which feels like a nod to the structure of Chinese characters. Later on in the game, you end up in a temple level, where the glyphs are covering the walls in a neat grid, and it definitely felt like some of the places I’ve been in China. 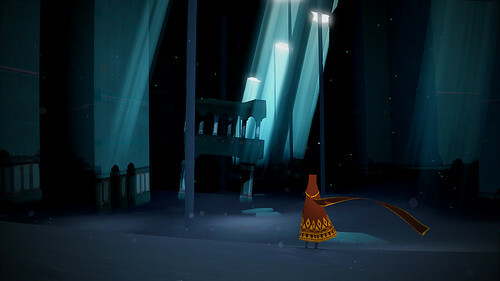 The game Journey is a rather obvious metaphor for life, but the mix of religious themes is striking too. 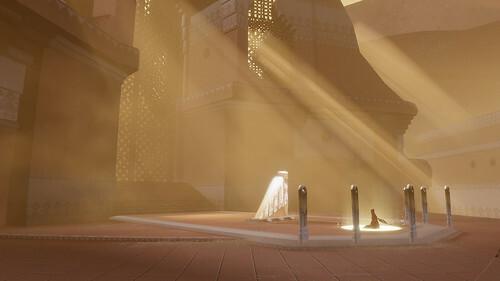 Mosque elements are blatant in the beginning, and snowy mountain monasteries at the end, but the single culture woven throughout the game is consistent, and there are ongoing themes of meditation and murals of spiritual significance. 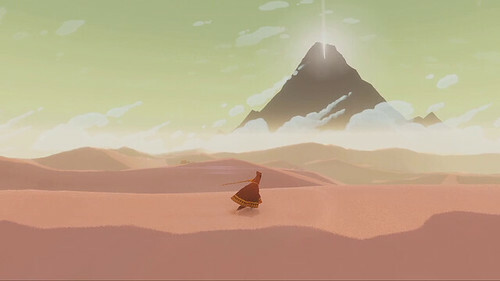 No “religion” is ever mentioned (in fact, the glyphs and beautiful music are the only “language” that appear in the game), but the intensely personal nature of the quest and the white-clad enlightened ones returning to help the new pilgrims (a game mechanic built into the game’s trophies) feels very Buddhist. 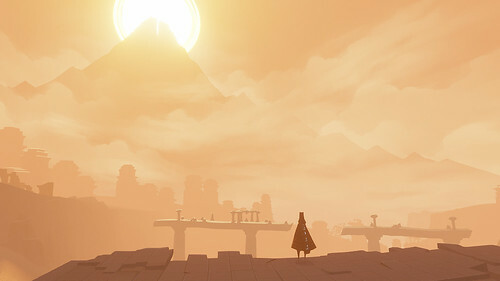 The makers of Journey wanted to do something different with Journey by innovating around the emotional response a game could evoke. 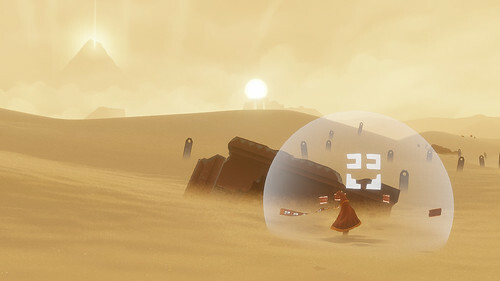 In this way, games can appeal to wider audiences, and perhaps even come closer to “art.” But Journey is a worthwhile experience for anyone interested in Middle Eastern or East Asian culture, especially from a design perspective. The writing system alone is worth admiring. 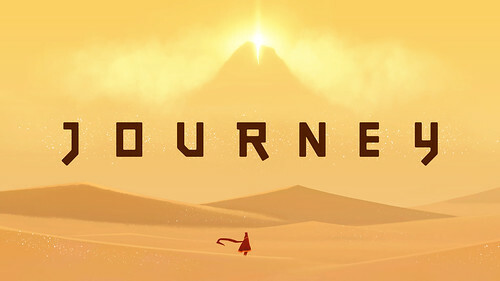 If you have access to a PS3, check this game out. Not as fun as last year, though! I’m still not a huge fan of this holiday, and it’s getting harder and harder for this country’s residents to go home to it celebrate it properly, but it’s still an interesting time of year. 4. iPhone optimization for cell phone viewing. Please let me know if anything doesn’t sem to be working right for you. You may need to clear your cache and/or reload the page a few times. 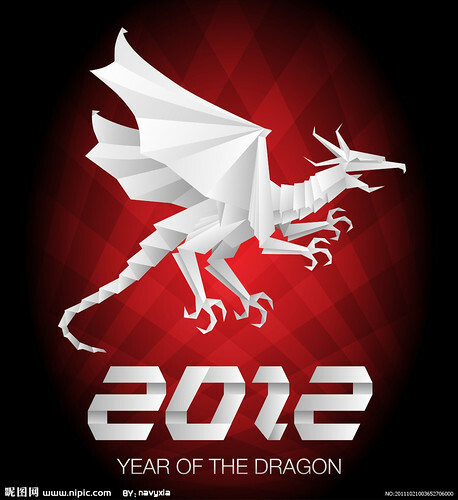 Thanks to Ryan from Dao by Design for once again doing a great job and being so easy to work with. 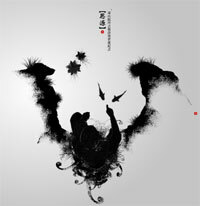 The new Sinosplice Design is up! I’d like to say thanks again to Ryan of Dao by Design for all his hard work in this Sinosplice redesign. Much of the work that went into the new site was “under the hood,” as Ryan worked out ways for me to move my “WordPress + static file hybrid” site into a modern, fully CMS-managed website. Now I can do everything (all sorts of updates) through the WordPress admin panel, which is enormously convenient. Furthermore, Ryan was really patient and professional about letting me try out some of my ideas. Some of them turned out to be deadends, but I’m really glad I got to try them out. Most often the end result was a design that was simpler, which is certainly a good thing. One of the goals of this redesign was to make it easier to interlink blog post content and non-blog content, particularly the language-related content. 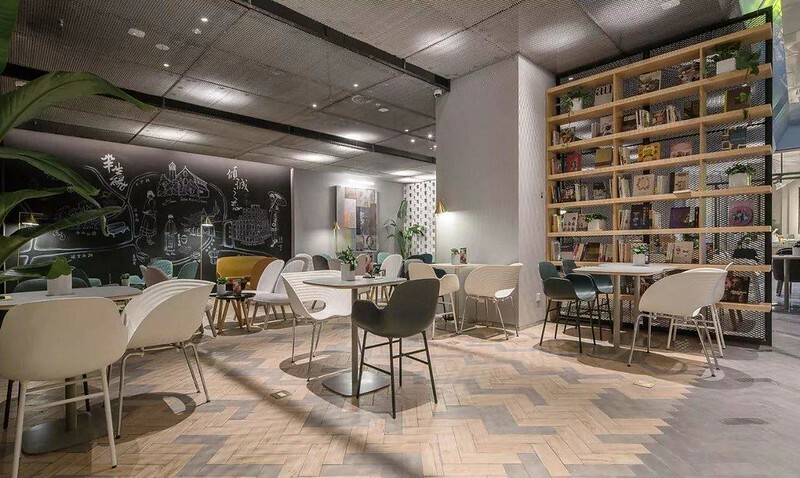 Although this redesign has already done that to a greater extent, the stage is set for me to organize the content much better for the casual visitor. Comments are now temporarily suspended on all blog posts as I prepare to move Sinosplice completely off DreamHost and onto WebFaction, my new host [more info]. On the new host Sinosplice will be sporting a new look (although much will remain the same… especially for you RSS readers!). Still simple and minimalist, but more professional and up-to-date, executed by Ryan of Dao By Design, the China blogosphere’s designer of choice. Ryan and I will be tweaking the new site over the weekend, so if all goes well the new design will go live and comments will come back on Sunday, February 7th. 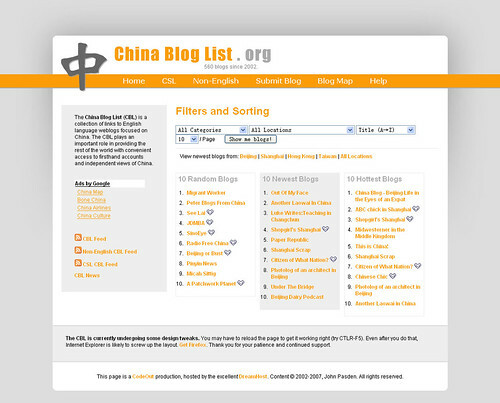 The whole “John has lived in China for x years” line at the top right corner of my website started about 2.4 years ago (sorry, couldn’t resist) shortly after I redesigned this blog layout. I was switching over to WP for the blog and PHP for the whole site in order to do cool time-saving stuff with includes, and I realized this opened up some other possibilities. The first thing that came to mind was the “John has lived in China for x years” calculation. I threw it up there for the hell of it, and for no special reason it has never come down. Since then, I have gotten some funny comments about it. Some people evidently think I am sitting around with a calculator, rushing to update my blog code every time the decimal changes. OK, so I may have a nerdy tendency or two, but I don’t do that, people. It’s a PHP script. Even the people that realize it’s a script take note of it, though. I guess it’s the counting years in decimals. No one really does that, and it’s just odd enough that people take note. I’m actually planning on updating my site layout soon. It’s been long enough. No major changes (wider layout, mostly), and I’m keeping the “John has lived in China for x years” line for sure. It’s just in the Sinosplice DNA now. 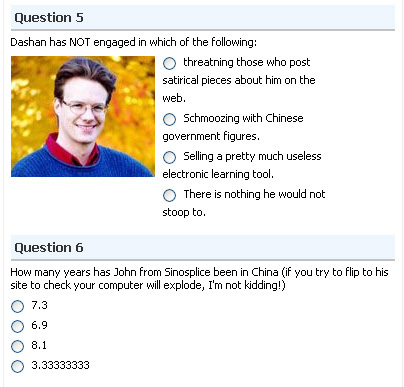 Thanks to Brad for pointing out the Facebook Laowai Test, and for being the one that coded the little “John has lived in China for x years” PHP script for me! I’ve been reading my friends’ blogs through Google Reader for a while now, so I don’t often actually go to their sites. I just visited Micah’s site today for the first time in a long time, and I was impressed. This site design is genius! And it really perfectly suits Micah’s eclectic-aggregated blogging style. Well done, Micah. Well done. For a while now, the CBL has been suffering from massive spam attacks. John B, the original architect of the current version, had already helped me implement simple filters and batch delete functions, but I was still just getting bombarded by automated spam blog submissions. Recent additions of a captcha on the submission page and a “check range” greasemonkey script (which allows me to check hundreds of spam submissions for deletion at once) have enabled me to get the problem under control. Being back in control inspired me to do the long-overdue layout update. Now that I am back in control, I also have a lot of blog submission approving to do. If you’re one of those people that submitted a while ago and you feel like you’ve been waiting forever, this is the explanation. And I will get to your submission. 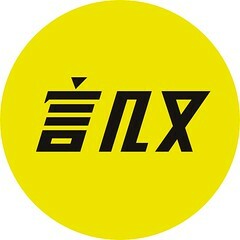 Oh, and while I’m on the subject of web updates, be sure to check out Dave Lancashire’s latest contribution to ChinesePod: the ChinesePod Dictionary. Very cool! 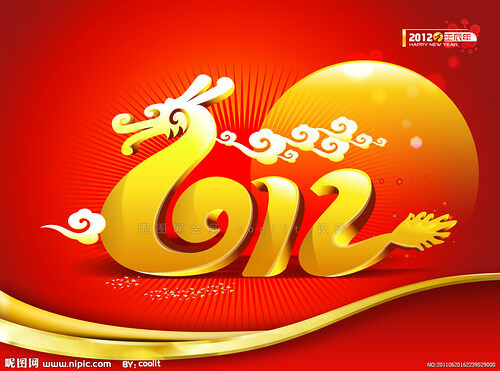 I love stylized Chinese characters. 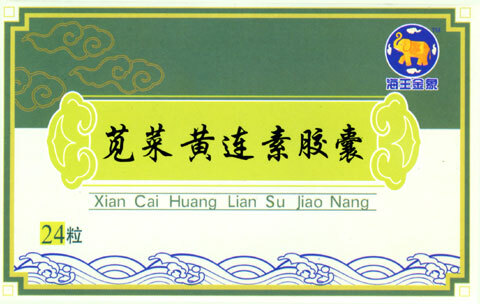 It says 西湖一號 (West Lake No. 1). 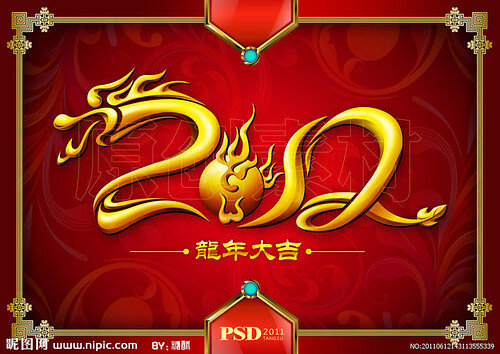 This is a good example of mainland Chinese designers using traditional Chinese characters for artistic effect (號 rather than 号). Taken next to West Lake in Hangzhou. I’m a bit late in calling attention to this, but it looks like I got my name on a Chinese crayon. Well, a Sinocidal crayon, anyway. What they call “John Pasden Gator Green” is affectionately (?) referred to by my friends as “Sinosplice Green,” or, to the slightly nerdier, #336633. I’ve been pondering a redesign lately. I won’t have time to do it until late summer, but I’m thinking… Less green. More white. More space. Wider than 800 pixels. Sorry, no time for a translation now. Try copying and pasting into AdsoTrans. Maybe I’ll get a chance to put up a translation later. 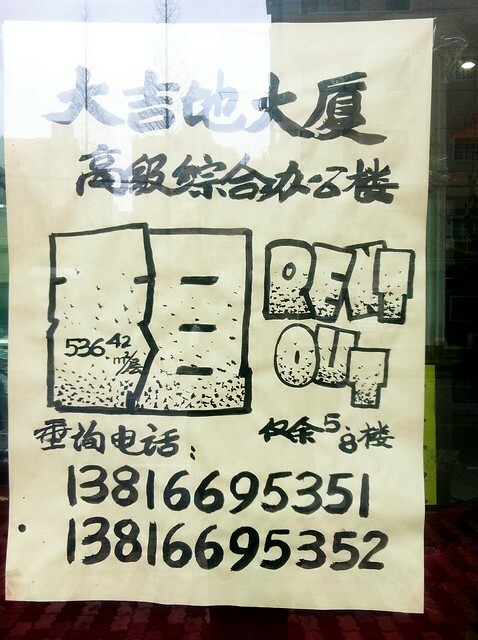 Also, I’m a little unsure of two unfamiliar words (which were a little hard to make out): 审观 and 僵然. Anyone who wants to jump in and translate in the comments, knock yourself out! 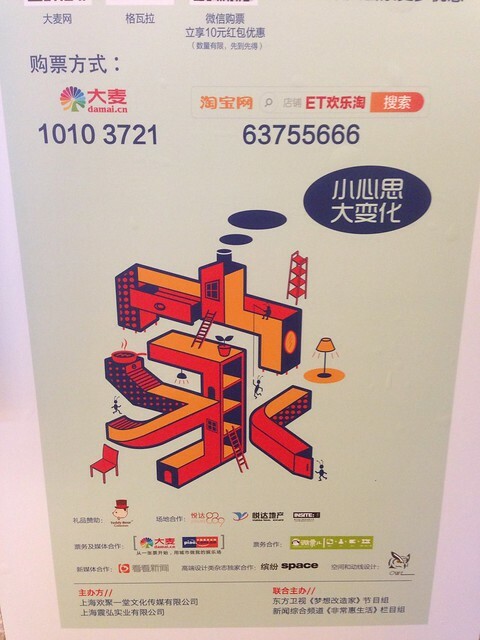 Chinawhite recently linked to some t-shirts for laowai in China. – Here comes a laowai. There goes the laowai. – I’m not a laowai, I’m a “foreigner.” [more on this issue] – I don’t want a watch. I don’t want DVDs. I don’t want a bag. – I will never give you any money. [in weird grammar] – Don’t think that just because I’m a foreigner I’ll buy your stuff for 5 times the normal price. I don’t find the shirts themselves very interesting, although I certainly understand the “inspiration” behind the shirts. What is interesting is the Chinese reaction to the shirts. There’s a fairly famous example of a foreigner causing a bit of a ruckus in Nanjing with a t-shirt listing rules for how the Chinese should interact with a foreigner. 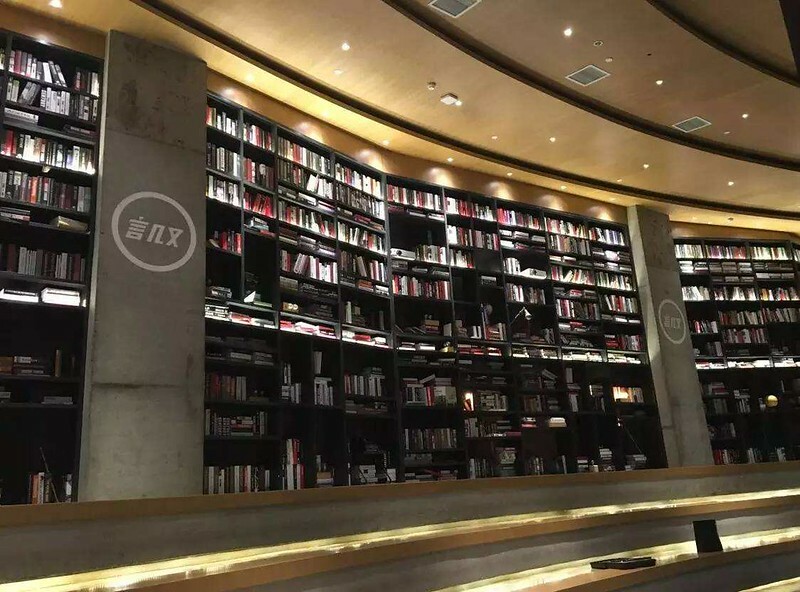 In that case “the people of Nanjing were angered because, reading between the lines of the T-shirt message, they saw a message of unwarranted arrogance and white supremacy. ” Obviously the messages above have the potential to piss off the Chinese as well. I’m not one to wear t-shirts designed to provoke anger or outrage. Still, if you want to buy one of those shirts (mainly one of the latter three) and wear it around China, I’d be very interested to hear what kind of reaction you got. 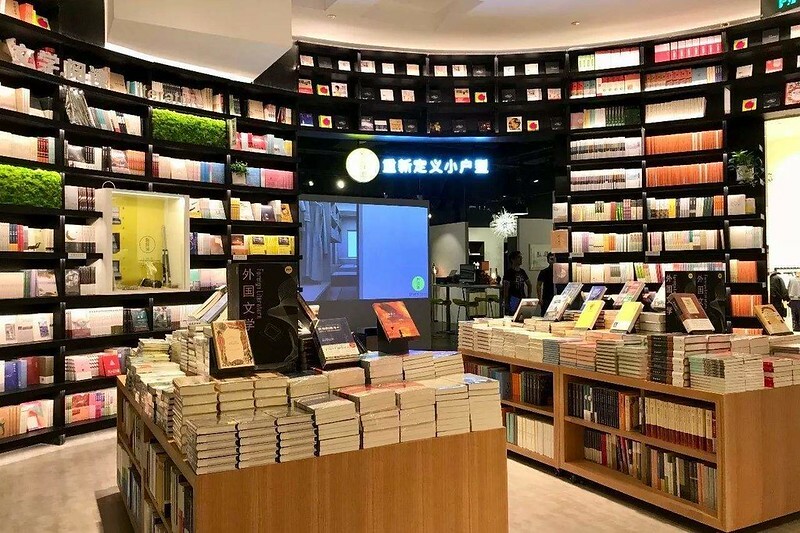 Note: I have already posted an entry about this entitled 老外的T袖衫 in my Chinese blog, asking my Chinese readers what they think. I may write a future post about their responses. Recently I bought a new notebook for scratch paper and random notes. I didn’t even glance at what it said on the cover. I just liked that it was lined and spiral bound. Now I feel kind of strange. My random jottings have been elevated to gospel. In the course of my daily life, I’m suddenly penning arbitrary gospel. This isn’t a case of Chinglish or Engrish. The English on the cover is all 100% error-free. 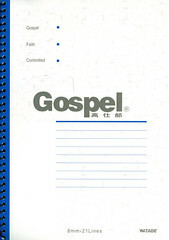 The Chinese, a transcription of the English word “gospel” into the Chinese 高仕部, is perhaps the most awkward aspect, language-wise. 2. Bandwidth. My photo albums get hit quite a bit, thanks to Google Images and other online photo indexing engines. Once I remove those albums from my own webspace, I’ll be using a lot less bandwidth serving photos, which means I free up more bandwidth for other things. 3. Mobility. If I ever have to move to a new server again, I won’t have to move my photo albums. Without the photo albums, my site takes up a lot less disk space, which means a simpler move. The downside is that I will now be paranoid that Flickr will get blocked by China, and then a huge proportion of the images on my site will no longer display for visitors in China. I’m really banking on Yahoo (owner of Flickr) keeping a good relationship with China and keeping its services unblocked in China. Anyway, check out the new Sinosplice Photo page (also accessible via that handy menu at the top of this page). Only the album index is hosted onsite; the albums themselves are on Flickr. OK, maybe this is really weird, but I really like the design of this medicine box. It just so happens to be antidiarrheal capsules of the traditional Chinese medicine variety. If you guys are really good, I’ll even give you an update and let you know how well they work! Related: More diarrhea on Sinosplice! I got some good feedback on my new layouts, including a request for a Chunky Salsa layout by one Jamie Doom. Greg offered zealous support for this idea. I don’t like to let down friends, so I gave it some serious thought. Jamie then proceeded to create a Chunky Salsa “layout” on his own blog. Jamie is a man of many talents, but I am sad to say that Chunky Salsa design skillz is just not one of them. I knew, however, that Jamie (and quite possibly Greg as well) had some serious, borderline neurotic needs for online Chunky Salsa, so I had no choice but to go that extra mile and put together my own Chunky Salsa layout. Get it while it’s fresh… it may not last! In the meantime, for those of you that need it, each new Sinosplice post can be a fresh bowl of China salsa for your minds. But this blog needs chips. You, the readers, can be those chips. Together we will boldly forge into uncharted Salsa-China blog territory!